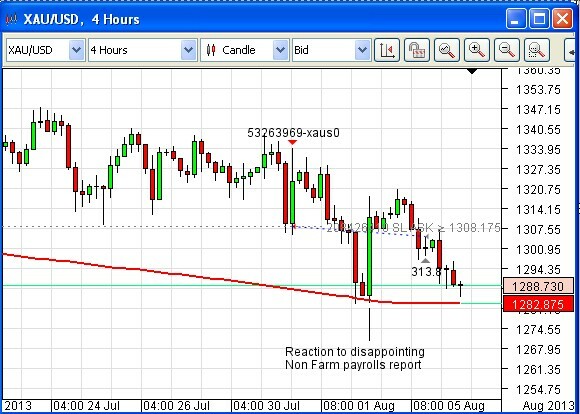 OmiCronFX : Gold has now lost its Non Farm Payroll report boost. Will it break support? Gold has now lost its Non Farm Payroll report boost. Will it break support? We have been short gold against the US dollar for a little while. As regular readers will know, this is based on the belief that US Quantitative Easing (QE) is on the way out. One thing that would delay tapering is any sign that the economy is still sick, and a rise in employment is probably the most significant sign of this. Therefore, when the Non-Farm payrolls report came out last Friday and indicated a number that was not as good as the market expected, gold got a boost (or the USD suffered a decline, if you choose to look at it that way). But what do we find this morning? Gold is right back to where it was prior to the NFP print, in a very quick time. That should tell us something, and if it goes below the support of the 200 period Simple Moving Average (SMA) on the 4 hour chart above, then it will have opened up a whole new area of potential losses.